Practice Makes Perfect: English Verbs offers ESL students an effective way to master English verbs. 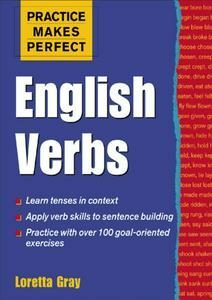 Concentrating on the three most challenging aspects of verbs–form, meaning, and use–it features comprehensive overviews along with exercises that present common regular and irregular verbs in everyday contexts. Students get to practice verb conjugations while gaining valuable insights into how context influences verb form in English. Coverage progresses from basic verb phrases to more complicated forms, such as modal verbs and verbal complements, and includes examples of sentence constructions in which verbs play a central role, such as imperatives, conditionals, and passives.